Back pain is one of the most common ailments in our modern society, no doubt due to the extensive amount of time many of us spend sitting each day – at a desk, on the couch, or in the car – and the tendency to slouch over our keyboards or wear high heels. Given that it frequently makes the Top 3 list of doctor-visit complaints, it’s no wonder we’re always wondering how to relieve back pain once and for all. Depending on the factors, an individual with back pain is usually placed in one of two categories: acute or chronic. Acute back pain is that which begins suddenly, and lasts for no more than three months. Chronic back pain builds gradually, lasts many months or even years, and often causes other, long-term problems. When over-the-counter pain medications just aren’t cutting it, doctors may prescribe NSAIDs (non-steroidal anti-inflammatory drugs), tricyclic antidepressants, or opioids, to alleviate serious pain in the upper or lower back. Opioids are suitable over the short-term, and are considered a good option for people experiencing acute back pain, but when the pain extends beyond two or three months, the body begins to build up a tolerance, and the usefulness of opioids decreases. As tolerance rises, individuals require more of the medication to feel the same amount of pain relief. This is because the brain has become reliant on the opioids, and has begun removing receptors to which the drugs can bind. As a result, the medication offers less and less relief from pain, and the necessary dosage increase begins to cause adverse effects; the likelihood of addiction rises exponentially, as does the possibility for over-dose. At this point, the benefits of pharmaceutical treatment begin to outweigh the detriments. This is where cannabis comes in. The results of cannabis treatment on patients with spinal injury and disease was examined in a recent, small study published by the Journal of Pain. The study involved 42 patients, who were administered either vaporized cannabis or a placebo. Even when psychoactive effects were taken into consideration (these effects could temporarily mask pain, without really relieving it), the patients had significantly improved pain scores following their ingestion of cannabis. Animal research has agreed with the few, small human studies. Beyond the treatment of pain, the anti-inflammatory benefits of cannabis were highlighted when rats with degenerative disc disease showed less intervertebral disk breakdown after being treated with a cannabis product. Cannabis has been shown to dull or even eliminate back pain as well as opioids, without the worrisome side effects. Small amounts of quality cannabis products allow people to carry out the day-to-day activities they found difficult or impossible without medication – working, driving, etc. – and enables them to sleep through the night, unfettered by pain that before caused them to repeatedly awaken. 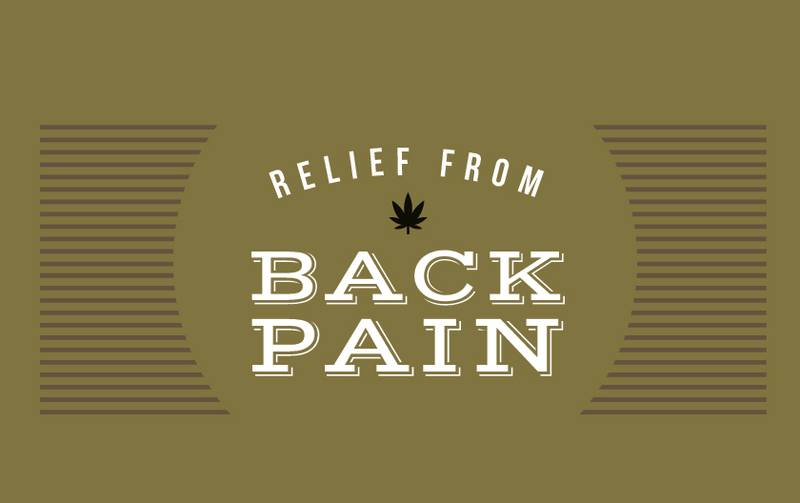 Thanks to cannabis treatment, individuals with severe, chronic back pain have been able to supplement their use of opioid or other pharmaceutical drugs. Some research suggests cannabis may even enhance the benefits of the prescribed medication. In some cases, cannabis patients have been able to completely remove pharmaceuticals from their treatment regime, relying solely on cannabis to alleviate their pain. Cannabis users also develop a tolerance to treatment, which requires increased dosage over time, but the side effects of this tolerance are not as dangerous as those of opioids. Cannabis high in THC can cause dizziness, headaches, fatigue, and some psychoactivity, but not only are these side effects fleeting, they can also be completely avoided by using certain products. Individuals who want to bypass the psychoactive effects of cannabis can do so by selecting products that offer equal amounts of THC (a psychoactive cannabinoid compound) and CBD (a non-psychoactive cannabinoid). CBD counteracts the psychoactive effect of THC. The cannabinoids have been shown to be more beneficial together than individually, though some animal evidence suggests CBD alone could also provide relief to those recovering from spinal cord injuries. Talk to a FARM staff member about the best options for your relieving your back pain. With our great selection of flower (to be smoked or vaporized) and topicals, we can always find a product just right for you.